Description: The Parish Office is closed from Monday, December 24th through Tuesday, January 1, 2019. We wish you a Merry Christmas and a wonderful New Year. Description: Join us for Mass at 10:00 a.m. Start the New Year with the Lord. Feast Day of the Solemnity of Mary, the Holy Mother of God. Description: Adoration of the Lord. Come have a quiet moment of prayer, worship and meditation at St. Matthew's Friday from 9 a.m. to 12:00 p.m. Description: Please join us for the Chaplet of Divine Mercy on Sunday morning. Description: The Social Concerns Ministry is collecting used jeans and gently loved stuffed animals for donations to farm workers in the Coachella Valley. All sizes men, women and children. Also needed long sleeved flannel shirts. Description: Women In God Spirit - Looking for a way to grow spiritually? Join us as we study the Bible, share our lives and pray together on Thursday. Room 5 Parish Center. Description: Youth Mass on Sunday at 5:00 p.m. Hope to see you there! Description: Youth Night in the Parish Center at 6:00 p.m. Description: Religious Education classes begin again at their usual time. See you at the Parish Center. 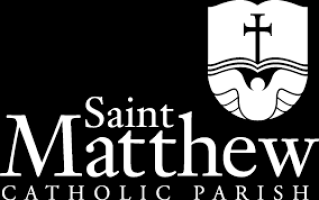 Description: Join the St. Matthew MOMS for a light breakfast and a video "Fearless and Free" in the Parish Center room 1. Call Sarah Ibbetson at 951-858-1935. Description: The Feast of the Santo Nino is a traditional Filipino celebration of the love of the Holy Child Jesus. Bring you image of the Santo Nino to be blessed at the 5:00 p.m. Mass. Reception in the Parish Center after all are welcome - food, dancing and raffle prizes. Open to all. Come and study the Gospel of Matthew each Monday in Room 1 of the Parish Center. $25 dollars for study guide materials. The Parish Office is closed from Monday, December 24th through Tuesday, January 1, 2019. We wish you a Merry Christmas and a wonderful New Year. Join us for Mass at 10:00 a.m. Start the New Year with the Lord. Feast Day of the Solemnity of Mary, the Holy Mother of God. Adoration of the Lord. Come have a quiet moment of prayer, worship and meditation at St. Matthew's Friday from 9 a.m. to 12:00 p.m. Please join us for the Chaplet of Divine Mercy on Sunday morning. The Social Concerns Ministry is collecting used jeans and gently loved stuffed animals for donations to farm workers in the Coachella Valley. All sizes men, women and children. Also needed long sleeved flannel shirts. Women In God Spirit - Looking for a way to grow spiritually? Join us as we study the Bible, share our lives and pray together on Thursday. Room 5 Parish Center. Youth Mass on Sunday at 5:00 p.m. Hope to see you there! Youth Night in the Parish Center at 6:00 p.m. Religious Education classes begin again at their usual time. See you at the Parish Center. Join the St. Matthew MOMS for a light breakfast and a video "Fearless and Free" in the Parish Center room 1. Call Sarah Ibbetson at 951-858-1935. The Feast of the Santo Nino is a traditional Filipino celebration of the love of the Holy Child Jesus. Bring you image of the Santo Nino to be blessed at the 5:00 p.m. Mass. Reception in the Parish Center after all are welcome - food, dancing and raffle prizes.